Artichokes are a beautiful vegetable to eat and grow and have been used as a liver tonic in traditional western herbal medicine for centuries. I’m actually growing some right now, they are prolific, and need very little attention. If left unpicked they produce the most incredible purple flower head. They are however, fantastic to cook up and have been included in Mediterranean cuisine, as far back as the 9th century. 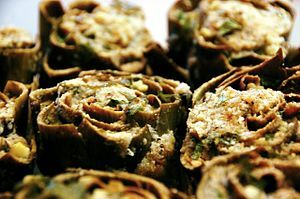 At the end of this blog I’m going to include my mother’s stuffed artichoke recipe that requires a little bit of time, but well worth the effort. Artichokes are in season now so if you’ve never cooked them before this is the time to do it. My children beg me to make this dish regularly because it’s so delicious and fun to eat. In herbal medicine, it’s the leaf that is used to extract a particular bitter constituent called cyanarin, that makes it such a useful liver herb. It’s great for lowering cholesterol, and it increases bile flow, which aids digestion and constipation. A review of clinical data between 1936 to 1994 showed that globe artichoke extract lowered cholesterol and triglyceride levels from between 5% to 45%, reducing the risk of coronary heart disease. Globe artichoke extract is also know to improve nausea, flatulence, belching and fat intolerance. It’s also high in folate, and has reasonable amounts of iron, and magnesium. Combine all dry ingredients into a blender and roughly blend, so it looks coarse, but not chunky. Transfer ingredients into a bowl and add the oil, vinegar, salt and pepper. Mix it in with your hands ensuring the ingredients are nice and moist. If you need to moisten the ingredients a bit more just add a dash of oil and vinegar. The mix shouldn’t be too wet. There is no exact science, taste to adjust seasoning. If you want to add more mint or parsley go ahead. Remove a layer of the outer LOWER leaves of the artichokes, give them a wash, turn them upside down and bang them gently on your chopping board. This helps open the leaves up a little and makes it easier to stuff them. Collect small amounts of the stuffing mix with your hands, pull the leaves back gently and stuff them. Not every leaf needs to be stuffed but make sure the mixture is divided evenly amongst all your artichokes. Also ensure that the central part of the artichoke is stuffed. Find a pot that will snuggly fit all the artichokes so they are supported by one another. Sit them upright in the pot and add enough hot water to cover the artichokes a quarter of the way up. Do not submerge the artichokes in water or you will lose all your filling. Drizzle some olive oil on top of the artichokes and in the water. Gently simmer away on the stove top for an hour or so with the lid on, checking the water level regularly and topping up with water if needed. You will know when they are ready if you pull on some of the artichoke leaves and they come away easily. The house will also smell amazing. There is only one way to eat stuffed artichokes and that is with your hands. It’s a bit messy but lots of fun. Place the artichokes in a bowl on the table with a bit more olive oil drizzled on top. Select the fattest looking artichoke you see and start to dismantle it leaf by leaf with your hands. The stuffing will be stuck to the leaf, so you need to turn the leaf stuffing facing down and pull the stuffing and the ‘meat’ of the leaf off with your teeth. You will notice that the base of the leaf is juicy and tender and will become more so as the layers of the artichoke are gobbled up. Not all the leaf is edible, only the tender bits that pull away with your teeth. Finally you reach the prized artichoke heart. Heavenly !! Good Luck and Happy Eating and remember they are sooo good for you. This entry was posted in Health Blog and tagged artichokes lower chholesterol, bloating, digestive disturbances, liver lonic, stuffed artichoke recipe on October 27, 2012 by 66mo.